DELANO — Shutting out an opponent 40-0 is a great way to respond to a tough opening-week loss. Delano pitched that lopsided shutout against Little Falls Friday night at Tiger Stadium. The win ran the Tigers’ record to 1-1 following a 37-19 loss at Zimmerman six days earlier. Much to the delight of his own sideline, Delano’s Reno Bredahl cuts toward the middle en route to the end zone on what was a 53-yard touchdown reception just before halftime last Friday night against Little Falls. The Tigers won the home-opener 40-0. The win was just what Delano needed following the opening-week loss. The upstep in play in the second game was the product of the players taking responsibility, according to coach Merrill Pavlovich. The players stepped up and produced what was the 299th career win for Pavlovich, who is in his 43rd year as Delano’s coach. Pavlovich is 299-147 entering this Friday’s home game against longtime foe Glencoe-Silver Lake. In the win over Little Falls, Delano completely controlled the line of scrimmage on both sides of the ball. 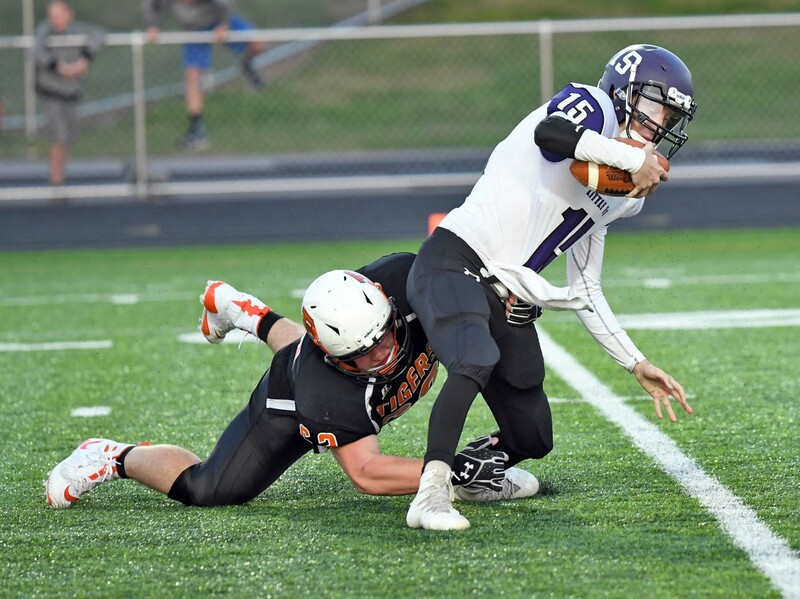 That allowed quarterback Max Otto and the Tigers’ offense to run fluently and the defense to routinely disrupt any flow the Little Falls’ offense managed. Delano’s offense gained 418 total yards. The defense gave up 139 yards. “We minimized our mistakes tonight. We moved the ball when we had to,” said Pavlovich. The Little Falls offense crossed midfield only three times, and never passed Delano’s 35-yard line. Otto threw four touchdown passes to four different receivers in the first half. Those four scoring completions were part of an efficient night for Otto, who completed nine passes for 185 yards in less than three full quarters of play. He was intercepted once. “In pass blocking, we were a brick wall that was unpenatrable,” said Poll. That line was pretty good in creating holes for the Tiger running backs, as well. Delano ran the ball for 233 yards and two touchdowns on 36 carries. Delano took a 33-0 lead into halftime. The Tigers scored the only touchdown of the second half in the third quarter. The fourth quarter was played with a running clock. The Tigers’ first three touchdowns came form the arm of Otto. He hit fullback Chris Gluz over the middle for an 11-yard touchdown with less than three minutes to play in the first quarter, and, with 37 seconds remaining in that opening quarter, connected with Reno Bredahl for a 53-yard touchdown. George Horobin’s extra-point kick was good following the Glunz touchdown and was blocked following Bredahl’s sprint to the end zone. The score stood at 13-0 through the first four minutes of the second quarter. Otto, tight end Trey Longstreet and a wall of offensive linemen changed that when they executed a perfect middle screen pass. Longstreet caught the ball uncontested and rode the wake created by those linemen for a 35-yard touchdown reception. Horobin’s extra point made it 20-0. The run of touchdown passes ended five minutes later, when senior halfback Sam Kern trotted in for a one-yard touchdown run. The air assault picked up, again, near the end of the half, when Kern high-pointed the ball in the end zone for a 15-yard touchdown pass from Otto, who stood all alone in the backfield while waiting for Kern to break open. The two-point conversion following Kern’s run failed. Horobin kicked the extra point through following Kern’s catch to make it a 33-0 game with 15 seconds remaining in the first half. In three quarters, Kern ran 14 times for 123 yards and one touchdown. As a receiver, he caught the one pass for a touchdown. The two drives that ended in Kern touchdowns were both spawned by interceptions. Kern’s touchdown run came six plays after Delano sophomore linebacker Adam Brown snagged an Austin Udy pass. Kern’s touchdown catch came on the fourth play following a Longstreet interception near midfield. Little Falls seemed indecisive on the possession that ended with Longstreet’s intereception, which began with 1:34 remaining in the first half. The offense gave the appearance it wanted to run out the first-half clock when it took its time in the huddle following a first-down run, but, then, went to the air on second down. Longstreet intercepted the ball and was quickly tackled with 41 seconds remaining in the half. Delano, on the other hand, was quite decisive it its play-calling, seeking that final score just before the half. It took the Tigers just 26 seconds to cover the remaining 57 yards to the end zone. That late second-quarter touchdown was the first step to bookending halftime with scoring drives for the Tigers. After jumping on the third-quarter kickoff at its own 36-yard line, Delano used the first four minutes of the third quarter to march the 64 yards to the end zone in nine plays. Fullback Caden Link finished the drive with a one-yard touchdown run. Horobin finished the night’s scoring with the extra point. Delano’s Spencer Poll takes down Little Falls quarterback Austin Udy for a sack in the first quarter last Friday night. The Tiger defense allowed the Flyers to cross midfield just three times in the game. Delano’s second offense took over from there. Link ran the ball just three times for five yards. Robbie Knight started at fullback for the Tigers. Water-bug quick, Knight darted for 61 yards on seven carries, as, both, a fullback and Delano’s quarterback for the final quarter-and-a-half.Bredahl showed his big-play ability with the long touchdown catch. He finished with three catches and 80 yards receiving. The touchdown catch was Longstreet’s third in two games. He finished with two catches and 65 yards Friday night.Leading that push up front was Poll, who was constantly in the Flyers’ backfield. He finished with one quarterback sack. “We were chasing the quarterback a lot,” said Poll. Ryan Carver also got to Udy for a sack. Former Delano player Isaiah Sloan carried the ball eight times for nine yards for the Flyers. TEAM Total Yards: Delano 418; Little Falls 139. Rushing: Delano 36-233 2TD; Little Falls 26-61. Passing: Delano 9-13/185 4TD; Little Falls 12-14/78, 2INT. INDIVIDUALS Rushing: Delano — Kern 14-123 TD, Knight 7-61, Paul 3-20, Otto 3-15, Winterhalter 3-7, Link 3-5 TD, Scherer 1-4, Rasmussen 1-4, Colanino 1–4; Little Falls -— Crosswhite 3-33, Like 2-17, Bontjes 5-16, Slaon 8-9, Shanoff 1–2, Udy 5–3, House 2–9. Passing: Delano — Otto 9-13/185 4TD INT; Little Falls — Udy 12-24/78 2INT. Receiving: Delano — Bredahl 3-80 TD, Longstreet 2-65 TD, Kern 1-15 TD, Unrein 2-14, Glunz 1-11 TD; Little Falls — Kush 8-57, Kirk 2-15, Like 2-6. Tackles: Delano — Brown 7, Campion 6, Carver 6. Interceptions: Delano — Brown, Longstreet. QB Sacks: Delano — Poll, Carver.